German Chancellor Angela Merkel (2nd fom L), Egyptian President Abd El-Fattah El-Sisi (L) and other leaders depart after the group photo at the G20 Africa Conference on June 12, 2017 in Berlin, Germany. Germany’s plan to fight poverty, hopelessness and terrorism in Africa is not a selfless act of solidarity. 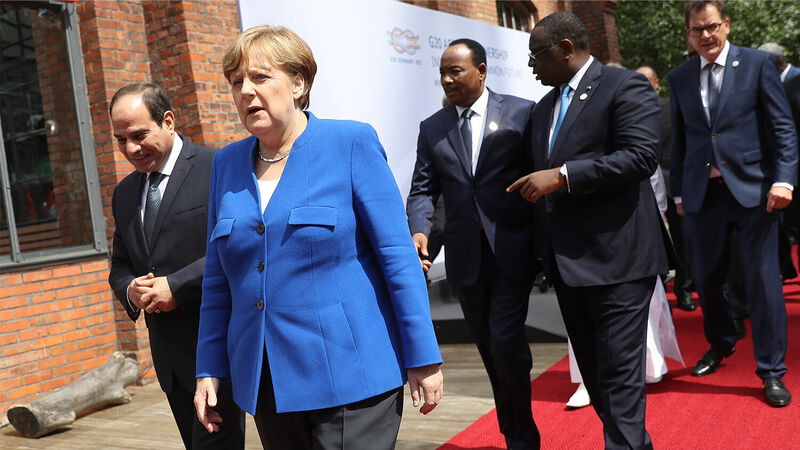 The heads of state of 10 African countries met on Monday, June 12, in Berlin to discuss a future cooperation with the G-20 to combat poverty and conflict in Africa and thus reduce the mass migration to Europe. Seven of the leaders agreed to an initiative which they are calling the Merkel Plan, comparing it to the Marshall Plan that rebuilt Europe after World War ii. But whereas the Marshall Plan was a mere economic aid, Merkel hopes to arm the African continent against terrorism. German Chancellor Angela Merkel, presiding over the G-20 this year, declared 2017 to be the Year of Africa. She knows that only changes within Africa can also secure Europe’s future. “If the lack of hope is too great in Africa, then, of course, there will be young people who believe they have to seek a new life somewhere else in the world,” Merkel said at the meeting in Berlin. “The G-20 Africa Partnership is a central project of Germany’s G-20 presidency. Its aim is to improve conditions for sustainable private sector investment, investment in infrastructure, economic participation and employment in African countries,” the official website of the German Finance Ministry wrote. The initiative plans on boosting private investment and investment in infrastructure in Africa. The seven African countries that have already responded positively to the German initiative are Senegal, Tunisia, Ivory Coast, Rwanda, Morocco, Ethiopia and Ghana. They were invited to Berlin along with the heads of state of Egypt, Mali and Niger, and the heads of the World Bank, the International Monetary Fund and the African Union. German Economic Development Minister Gerd Müller already approved a budget of €300 million (us$334 million) to spark these ambitions. But both sides know that much more will be needed. Africa is not only stricken by poverty and crime but also by a population explosion. Estimates conclude that the population in Africa might double by 2050. But the next generation, which is estimated to be more than a billion in number, needs a future in Africa. But what Germany hopes most of all to achieve in the region is to equip African nations so they can stand and fight against the spread of terrorism. The official German report on the arms trade in 2016, which Handelsblatt has seen, suggests that exports fell from its 2015 level of €7.86 billion, around $8.81 billion, to €6.85 billion in 2016. However, this remains a historically high level of exports. An interim report on the first four months of this year showed a further fall, with exports dropping to €2.42 billion from €3.3 billion for the same period last year. In 2016, war weapons worth €2.5 billion were exported—nearly 1 billion more than 2015 (€1.56 billion). This is seen from a draft armament export report (seen by Bild). The bulk of the export of war weapons (€2.3 billion) went to third countries (2015: €1.17 billion), so states outside the EU or nato. One nation, in particular, stands out of the recently released arms report: Algeria. Germany’s export of war weapons into Algeria amounted to almost €900 million. It leads the chart as receiver of a total of €1.4 billion of German armaments. Other countries, like Saudi Arabia, try to avoid the critical imports of German weapons and instead bring German weapons expertise into their own country. Considering Chancellor Merkel’s statement at the meeting last week, one can expect the exports of war weapons to further increase. “For many years, we felt good when we didn’t focus on military equipment. … But we have to be honest—only where security is ensured can development take place,” she said. Terrorism is increasingly spreading in the region, and Merkel knows that the African countries are not adequately equipped to face the challenges. As terrorism started to spread all over northern Africa, Trumpet editor in chief Gerald Flurry noted that Germany will defend its interest in the continent. Iran also wants “more dialogue with Africa”—only it’s looking for dialogue in a different way. Who is ultimately behind all these terrorist attacks? The king of the south—Iran. But it is being opposed now by Germany on many fronts. You are going to see these two powers clash very soon—like a year or two or three. The Daniel 11:40 clash between the king of the south and the king of the north is about to be fulfilled! All of this violence in Africa is just a prelude to the fulfillment of this prophecy. Mr. Flurry wrote this in 2013 in his article “Watch Algeria!” and he challenged all readers to watch Africa for an increased German presence. Germany’s meeting with African heads of state proves that he was right. Since 2013, both Iran and Germany have worked hard to spread their influence in the region. Soon they will directly confront each other. You have to read his article on Germany’s “whirlwind” strategy to find out what is ahead for the region and how Mr. Flurry could make those predictions.